Joe Gibbs Racing have exercised a stranglehold on the 0.75-mile Richmond International Raceway winning the races for the past two NASCAR Sprint Cup seasons. 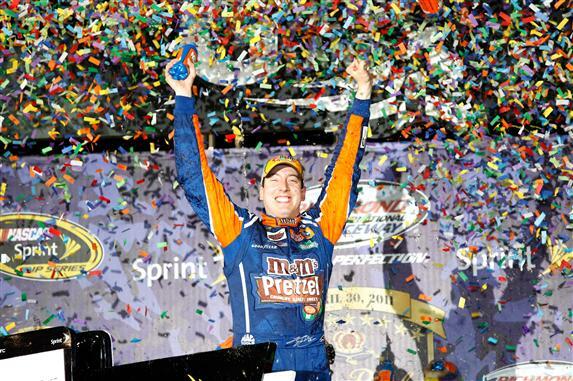 In 2011, this dominance has continued with the Kyle Busch's 3rd straight spring victory at the CROWN ROYAL Presents The Matthew & Daniel Hansen 400. Assembled in front of a 43-car field, Juan Pablo Montoya's #42 Chevrolet Impala led the NASCAR Sprint Cup series to the final short track race in the spring tour also involving Bristol and Martinsville. Holding on to the lead through the initial 25 laps, Montoya was overtaken when Clint Bowyer performed the night race's first lead change. Following Bowyer's 18 laps spent at the front of the caution-free event, the highest qualifying Toyota at Richmond showed considerable race pace. Kasey Kahne stormed past the #33 Chevrolet with the #4 Red Bull car where the future Hendrick Motorsports pilot rode for 29 circuits in the lead position of the 400-lap race. Both the #4 and the #33 cars would have a consistent presence in the race concluding with top-10 finishes. While much of the first two-thirds distance in the CROWN ROYAL Presents The Matthew & Daniel Hansen 400 past soundly, some expected short track drama was produced between two Chevrolet drivers. On lap 106, the #39 US Army car of Ryan Newman and the #42 Earnhardt-Ganassi Racing Chevy piloted by polesitter Juan Pablo Montoya restarted a lingering feud on the race track when the two made contact out of turn 2. The #42 Chevrolet of Montoya had skated under Newman and made contact with the #39 when he was entering the backstretch. Unsettled by the front end contact from the Ryan Newman's #39 car, Montoya slapped the outside wall where the Earnhardt-Ganassi Racing Chevrolet suffered sizable right-rear quarter panel damage. 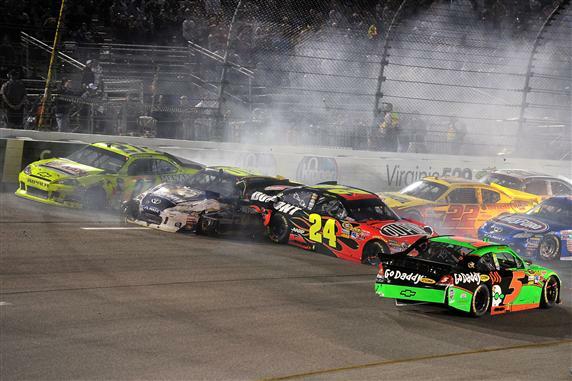 Debris from the #42 Chevrolet necessitated the first caution at the NASCAR Sprint Cup race at Richmond International Raceway. The incident between Newman and Montoya was not be the last between drivers. On lap 238, Juan Pablo Montoya had reacquainted himself with the #39 US Army Chevrolet. As the two cars were entering turn 3, Montoya aggressively pressed his front bumper into the right counter of the #39 car's rear bumper. The impact sent Newman spinning through turn 3 narrowly avoiding major contact with the outer retaining wall. Receiving only a firm warning from NASCAR, both Juan Pablo Montoya and Ryan Newman rested only further attempts of on-track skirmishes. As Newman ultimately finished 20th in the event, the driver immediately went to the NASCAR officials hauler. Montoya was mum to the press following the race. Braking the rhythm of what was a tame race on the 0.75-mile oval, lap 301 saw a massive wreck triggered on the backstretch. In a tight pack of cars, the #33 of Clint Bowyer touched Matt Kenseth's #17 Ford. Causing Kenseth to slide up the track, the #17 collides with the #24 Chevrolet of Jeff Gordon sending the 4-time NASCAR Sprint Cup champion into a scary hit into the inside wall of Richmond International Raceway. Involving 9 cars total suffering varying states of damage, there were fortunately no injuries. Under caution from lap 302 to 314 for the big wreck, this yellow flag period would be the final slowdown of the CROWN ROYAL Presents The Matthew & Daniel Hansen 400. In a critical restart, the #18 Toyota of Kyle Busch started 4th as the green flag flew once again. With a mix of good timing by the #18 Toyota and than-second place Dale Earnhardt Jr spinning his tires, Busch marched his way to the definitive lead of the race in only three laps. Passing Jeff Burton, Kyle Busch let sail to the checkered flag. Busch finished more than 1.8 seconds ahead of Joe Gibbs Racing teammate Denny Hamlin piloting the #11 Toyota. Beyond being a good race for Joe Gibbs Racing, Ford's Roush-Fenway Racing team and Team Red Bull both enjoyed strong top-10 results. Filling the top-5 for the CROWN ROYAL Presents The Matthew & Daniel Hansen 400 is the #4 Toyota of Kasey Kahne, the quiet but solid #6 UPS Ford of David Ragan and Carl Edwards' #99 Ford. While Chevrolet teams showed collective strength in qualifying Friday, Clint Bowyer was the highest finishing member of the NASCAR Sprint Cup 'Bowtie Brigade' coming home 6th overall. Not having a good Richmond race was the Hendrick Motorsport team. Jimmie Johnson was the highest finishing car in the Hendrick stable in 8th place. However, Johnson's day was marred by a miserable early half of the NASCAR Sprint Cup 400-lap event topped by contact seriously damaging the #20 Home Depot Toyota driven by Joey Logano. With Jeff Gordon caught in the major wreck ending a promising race, Dale Earnhardt Jr and the #88 team used late race strategy to elevate them to up to 2nd place but needed to pit with a handful of laps to go at Richmond International Raceway. Earnhardt Jr finished 19th in the race but holds a 4th place spot in the overall Sprint Cup championship standings. Presently, Carl Edwards leads the 2011 NASCAR Sprint Cup championship points 9 markers ahead of Jimmie Johnson. The NASCAR Sprint Cup tour's next stop is another Saturday night affair on the historically tough Darlington Raceway.